May 15, 2018 - This leopard was out hunting in the Sabi Sand Game Reserve, South Africa. It came upon a herd of wild African buffalo and seemed to think one, perhaps a calf, might make a good meal. The buffalo didn’t like that idea. A few members of the herd cornered the hungry leopard. He dashed up a fallen knob-thorn tree. While on the fallen tree, the leopard came dangerously close to the buffalo. The leopard was stuck for 30 minutes. Leopards don’t often hunt African buffalo because they’re too large and very aggressive. 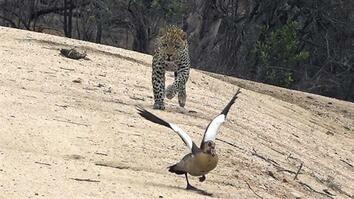 On rare occasions a leopard will kill a buffalo calf. 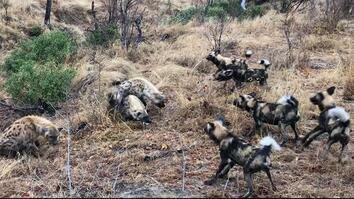 But failure was inevitable when trying to attack a buffalo in a large herd. This leopard is lucky it escaped alive. 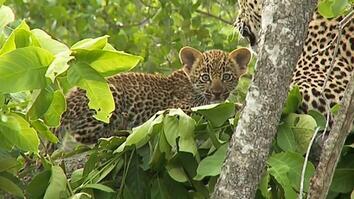 This leopard was out hunting in the Sabi Sand Game Reserve, South Africa. It came upon a herd of wild African buffalo and seemed to think one, perhaps a calf, might make a good meal. The buffalo didn’t like that idea. A few members of the herd cornered the hungry leopard. He dashed up a fallen knob-thorn tree. While on the fallen tree, the leopard came dangerously close to the buffalo. The leopard was stuck for 30 minutes. Leopards don’t often hunt African buffalo because they’re too large and very aggressive. On rare occasions a leopard will kill a buffalo calf. But failure was inevitable when trying to attack a buffalo in a large herd. This leopard is lucky it escaped alive.